“I’ve been knocked on my rear by every western star, including Annie Oakley. 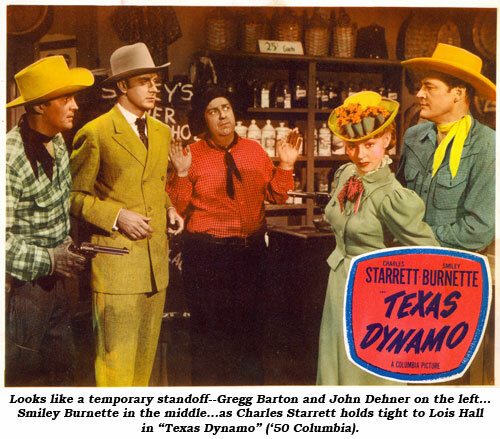 When the price is right, I’d let anyone knock me down.” One of the busiest heavies of the late ‘40s on through the ‘50s, particularly on the TV screen, was stubbly bearded Gregg Barton—especially in Gene Autry’s Columbia westerns and TV series. Born Harold Wilsea Barker June 5, 1912, on Long Island City, New York, during the time the Infantile Paralysis epidemic swept through the city, Hal’s father was George Wilsea Barker born in Kent, England, and his mother was Mae Malcolm, born in New York of Scottish heritage. Hal’s father, an electrical engineer, died at 33 when Hal was only 3. As his father was a Mason, Hal (age 3) and his older brother, age 4, were accepted into the Masonic Home and sent to their Home for Boys in Burlington, New Jersey, where Hal grew up. His younger brother did not go as he was only one year old. Interestingly, prior to that, when Hal was younger, the children’s babysitter was a teenaged Ethel Merman. Finishing high school, Hal attended the University of North Carolina at Chapel Hill on a football scholarship. Hal went to work as a sales rep for a textile company but soon tired of this and headed west for greener pastures in California where he worked at odd jobs until he stumbled into the acting profession during a party at a friend’s house circa 1939. MGM tested him and put him through their school, although nothing transpired. Hal studied at Bliss-Hayden Theatre and did little theatre work. 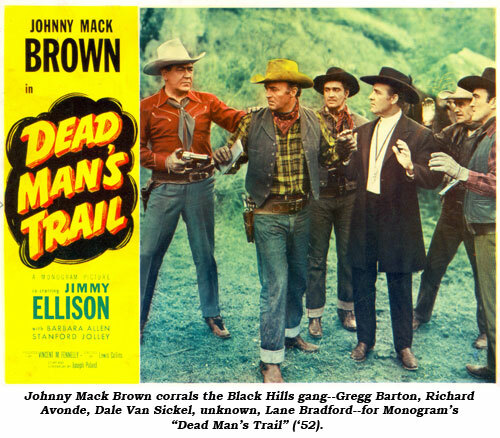 He acquired an agent and switched his name to Gregg Barton to avoid confusion with Lex Barker or Jess Barker. He was just getting started with a bit in “A Yank At Eton” (‘42 MGM) and a decent role in John Wayne’s “Flying Tigers” (‘42 Republic) when he enlisted in the Marine Corps the day after the attack on Pearl Harbor. During WWII Gregg served as a tank commander with the 5th Tank Battalion, 5th Marine Division in the Pacific, taking part in the invasion of Iwo Jima. For his heroism in that battle he received the Silver Star. Reminded of this in later years, Gregg remarked, “They’re all heroes, all of them.” During his service period, ‘41-‘46, he achieved the rank of Major. Back in Hollywood, Gregg was hired to play the lead heavy in Eddie Dean’s “West To Glory” (‘47) which started him on his villainous career. 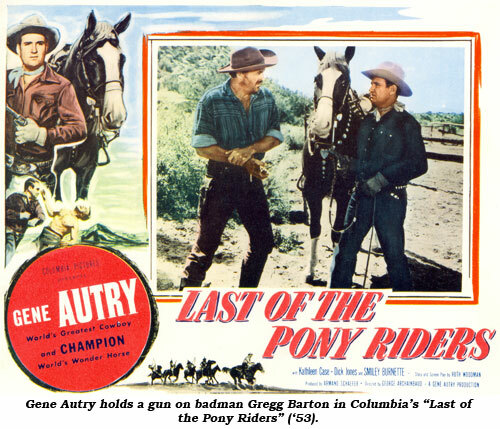 Besides roles in A films such as “Joan Of Arc” (‘48), “Tap Roots” (‘48), “Jet Pilot” (‘50) and others, Gregg menaced B-cowboys Charles Starrett, Rex Allen, Whip Wilson, Johnny Mack Brown, Bill Elliott, Wayne Morris and, of course, Gene Autry (11 features, 24 TVers), in the waning days of the B-western. Gregg found work too in A-westerns—“The Outriders” (‘50 MGM), “The Gunfighter” (‘50 20th Century Fox), “Distant Drums” (‘51 Warner Bros.), “Bend of the River” (‘52 Universal), “Drums Across the River” (‘54 Universal), “Man From Laramie” (‘55 Columbia), “Raw Edge” (‘56 Universal), “Joe Dakota” (‘57 Universal), “Gunfight At Dodge City” (‘59 United Artists), among others. 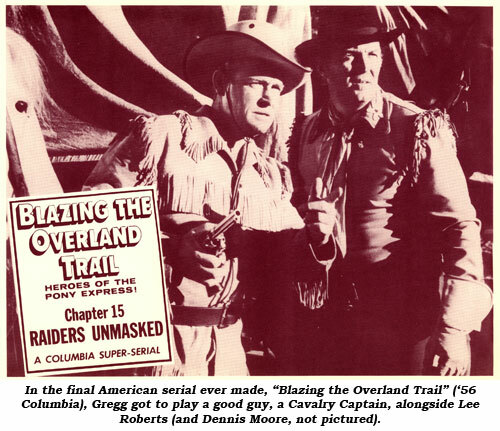 Gregg’s also in four of the latter-day serials, “Gunfighters of the Northwest” (‘54 Columbia), “Riding With Buffalo Bill” (‘54 Columbia), “Man With the Steel Whip” (‘54 Republic) and “Blazing the Overland Trail” (‘56 Columbia). 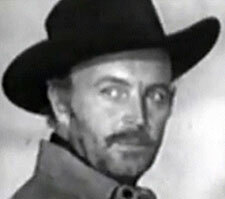 But it was on the ‘50s-‘60s TV screen where Gregg amassed well over 120 credits. 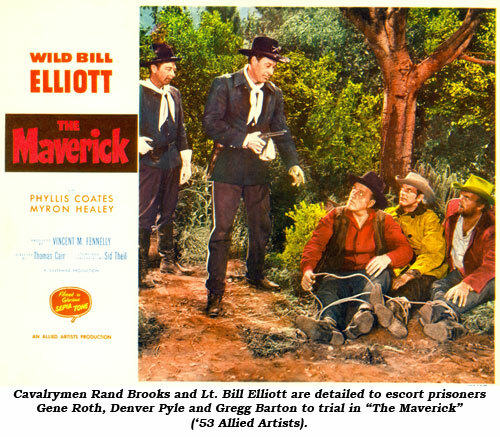 Besides those 24 Autrys, Gregg rode the outlaw trail on “Lone Ranger”, “Wild Bill Hickok”, “Roy Rogers”, “Range Rider”, “Annie Oakley”, “Tales of the Texas Rangers”, “My Friend Flicka”, “Wyatt Earp”, “Sgt. 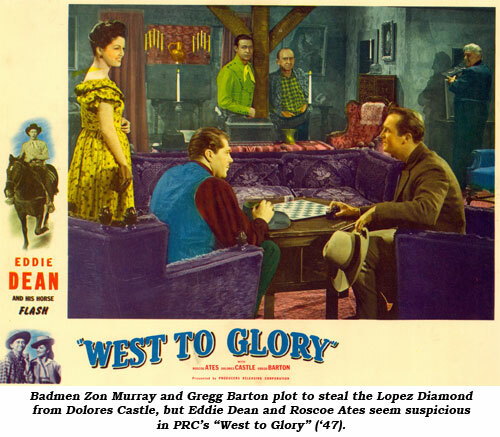 Preston”, “Zane Grey Theatre”, “26 Men”, “Kit Carson”, “Buffalo Bill Jr.”, “Colt .45”, “Cisco Kid”, “Casey Jones”, “Champion”, “Death Valley Days”, “Deputy”, “Hopalong Cassidy”, “Laramie”, “Maverick” and others. For over 10 years, in between his TV and movie work, Gregg managed a 1,600 acre cattle ranch at Bonsail, California. Retiring from films (his last was an episode of “Death Valley Days” in ‘66), Gregg worked for Safeco Title Insurance for 22 years where he became top sales rep in Southern California. Gregg was married in the late ‘40s, for about 14 years, to a lady named Helen Norris. After a long stretch as a bachelor, Gregg and Bonita Cooper were wed in 1983 until the time of his death at 88 on November 28, 2000, in the Fallbrook, California, convalescent center. His health had been failing since he had knee surgery earlier in the month. He is buried at Fort Rosecrans in San Diego, CA.